Simon & Schuster to Publish “OUTLAW PETE” by Bruce Springsteen and Frank Caruso | News and Corporate Information about Simon & Schuster, Inc.
New York, N.Y., August 28, 2014— Simon & Schuster announced today a major new book for the fall 2014 holiday season: Outlaw Pete by Bruce Springsteen and Frank Caruso, based on the celebrated song about a bank-robbing baby whose exploits become a meditation on sin, fate, and free will. 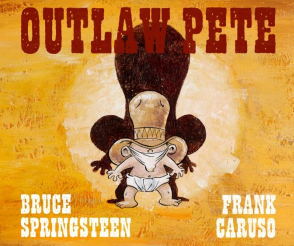 Both the song (from Springsteen’s 2009 “Working on a Dream” album) and the new book Outlaw Pete were inspired by a children’s book, Brave Cowboy Bill (Simon & Schuster, 1950), which Bruce Springsteen’s mother used to read to him as a child. “Outlaw Pete is essentially the story of a man trying to outlive and outrun his sins,” Springsteen writes. Picture books for adults have undergone a renaissance of late, from the success of similarly irreverent hits such as Ann Droyd’s Goodnight iPad and Adam Mansbach’s Go the F–k To Sleep to the resurgent interest in illustrators such as Richard Scarry, Maurice Sendak, and Edward Gorey. Simon & Schuster, which acquired World rights to the work, will publish Outlaw Pete on November 4, 2014.